The pelicans ate fish that had died because of a lack of oxygen and a toxic bacteria. ST. PETERSBURG – Pelicans that died in January were likely the victims of eating fish that had died from lack of oxygen in Riviera Lake No. 1 coupled with the outbreak of a rare toxic bacteria, according to a 90-page consultant’s report released today (April 3). The consultant, Arcadis, made several recommendations for preventing another fish and pelican kill. Among them: Reduce the phosphorous levels of the lake, keep reclaimed water from entering the lake and install aerators in the lake. St. Pete officials received a report Jan. 10 of a fish kill in Riviera Lake No. 1, a residential retention pond adjacent to Riviera Bay. Between Jan. 11 and 30, local and state wildlife officials received reports of 70 dead or sick pelicans found around St. Petersburg. The city hired Arcadis to figure out why the fish and pelicans had died. Arcadis sampled waters in Riviera Lake No. 1 and in Coffee Pot Bayou in January and March. An analysis of the water samples found that there was a lack of oxygen in the lake. That lack of oxygen was caused in part by an “explosive growth of algae.” The algae were feeding on an excessive amount of nitrates and phosphates in the lake. The algae became “infected by a rare bacteria,Clostridium botulinum,produced under the low-oxygen conditions at Rivera Lake No. 1,” the report said. The effect might not have been so bad had a cold snap and a cold rain not caused the deeper levels of the lake – where the algae were living – to mix with the warmer, upper lake levels. The high level of nitrates and phosphates could come from several sources, Arcadis said. Those sources include stormwater runoff from streets, driveways and lawns; waste from pets, birds and other wildlife; overspray from reclaimed water irrigation systems; and runoff into the lake from irrigation. To read the entire report, go to stpete.org. 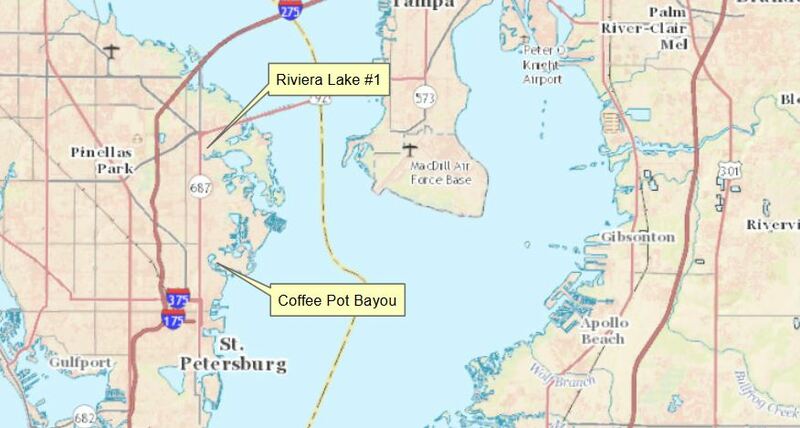 Map courtesy of Arcadis and city of St. Petersburg.